‘You speak of Lord Byron and me – There is this great difference between us. The rivalry and dislike between George Gordon Noel Byron, 6th Baron Byron, and John Keats has been much discussed; in their own time, however, it was felt far more keenly by Keats. Byron was a flamboyant and handsome nobleman whose wit, charm and ancestral title accorded him entry into the most elite circles of English society. He was also an accomplished and celebrated poet. 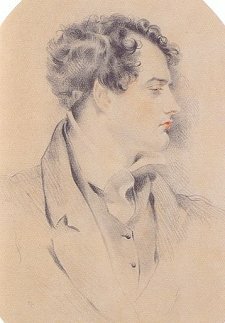 His first major work, ‘Childe Harold’s Pilgrimage’, was a great success and he enjoyed all the attendant benefits of celebrity. John Keats was a poor and struggling middle-class poet whose work was often savaged by the great critics of the age; he was advised that poetry was the provenance of nobleman such as Byron, and dismissed (by Byron, among others) as a ‘Cockney’ poet. The animus between Byron and Keats is easy enough to explain. Byron was a snob, though he occasionally rose above such petty social concerns. He also revered the 18th century Augustan poets, particularly Alexander Pope, whose adherence to the classical tradition is echoed in his own early poetry. Keats’s work was deeply at odds with the Augustans; also, his ‘Sleep and Poetry’, which Byron read, was critical of their work. Keats found inspiration in the extravagant and sensuous wordplay of the 16th century and also admired the works of Wordsworth and Coleridge. Those first generation Romantics poets had caused a literary revolution with their rejection of Augustan classicism. And so, quite simply, Byron disliked Keats’s poetry on an aesthetic level. Keats felt likewise about Byron’s work; he considered it overrated, slavish and unoriginal. It was a sort of reverse snobbery. But it is worth remembering that Byron came to recognize Keats’s talent. He also scoffed at the notion that anyone would be so sensitive as to die because of bad reviews (he himself was savaged more than once.) In this respect, Byron had more insight into Keats’s character than those who should have known him far better. After Leigh Hunt told Byron that Keats had admired his greatest work, ‘Don Juan’, Byron included a stanza about Keats; it alludes to the popular conception of his death via bad review. The last two lines of the stanza clearly show that Byron dismissed the idea. He also mentions Keats’s lack of classical learning. Incidentally, Keats did not like ‘Don Juan’; in a letter to his brother George, he referred to it as ‘Lord Byron’s last flash poem’ and Severn recorded Keats’s disgust with the work during their voyage to Italy.